the bayou - Lake Houston Fishing! 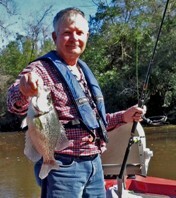 The white bass have moved into the bayou fairly good this week end. Yeah no doubt !! I thought so too until that line took off sideways at 100mph. Cool.....I might have to give them a try. Does anyone know the best color spiner bait to catch white bass in the bayou is. I caught a lot on black chart jigs last week but was wondering if they had a favorite color. so if your using a small spinner white will get the job done. 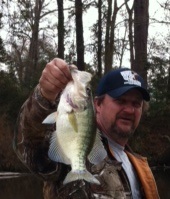 like it moving faster than the crappie do. Going to give the whites a try in the morning if the water is,nt to off color. Has anybody done any good on whites this week. I would like to try for white bass in the Luce bayou, but don't have much time to scout out and not familiar with the area. Can anyone point me in the direction of bank accessible spots? 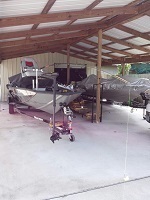 (not asking for honey holes) If not Luce bayou anywhere else with public access and bank access. Also when is a good time to hit them up? I appreciate any information you may provide. Is anyone catching any whites yet , or is it still to early. I know last year they were in Feb.
we may get more action.